A new tendency to call martial arts and other types of physical activities which imply pair work “sports” has appeared recently. It is necessary to explain clearly the difference between the terms of “sport” and “martial art” (Budo). First of all, the term “sport” implies three conditions which should be followed. First, the main aim is to win. Let’s say an aim to take part in the Olympic Games is to get a medal. Second, to win or to lose is judged on the basis of strict rules. So, even a victory can be considered a defeat if it is won by breaking the rules. Third, to follow these strict rules impartial and unbiassed judges are needed. All these three conditions are necessary for any kinds of any sports where there is a competetion against an opponent. Moreover, if these conditions are not followed, such activity cannot be called “sport”. Recently the Ministry of Education and Science of Japan has declared that martial arts such as judo and kendo should be taught at preliminary and secondary schools in order to cultivate the basics of etiquette in schoolboys and schoolgirls. However, if to speak only about the task to teach etiquette, an impression could be made that children who play basketball or football behave themselves much more politely than other children. Judo and kendo are being taught as “martial arts”. But don’t they (as they are today) correspond to the three mentioned above criteria of sports? I have heard that in judo a double leg takedown called morote-gari is prohibited nowadays. In kendo cut strikes on the carotid artery are prohibited. It turns out that there are rules, which means that we deal with sports. What is “a martial art” then? None of the listed above conditions can be applied to the martial arts. Appoximately 500 years ago when the Warring States period (the Sengoku period) was coming to an end, Zen master Takuan Soho wrote his work The Unfettered Mind (Fudochi Shinmyo Roku) for Yagyu Munenori Tajima-no-kami who was an instructor for the Tokugawa shogunate those days. Takuan also attached to his work the writings under the title Chronicles of the Sword of Taia (Taia-Ki) in which he wrote: “In the end a man is called a strategist irrespective of whether he starts fighting or not and irrespective of his strength or weakness”. In other words a man becomes a warrior not due to his victories or his physical power. That is the meaning of martial arts. This high and spiritual teaching already existed during the Warring States period when the blood was washed away with another blood. And today in the modern constitutional state where any gun or any manslaughter is prohibited, while speaking about Japanese sword shouldn’t we think about the meaning of “Budo”? In Aikido Yuishinkai we tend to do true Budo the aim of which is to perfect ourselves as human beings and to understand why the energy of our Universe (which is called in Japan “kami”) gave us birth. A lot of billions of years ago on one island in the primeval ocean the first oxygen molecula was released from cyanides; it took several tens of millions of years for that ocean to be filled with oxygen and then, some millions of years later, there was a life born in that ocean and the evolution which led to the appearance of living creatures existing today began. Isn’t that the manifestation of Heaven’s will created by kami (because in Japan Heaven (天, ama) means the same as神 (kami))? The words “Heaven’s will” (天の意, ama-no i) in Japanese can be read as ai (天意) which is consonant to the word “love” (愛) and the same concept can be called as “spiritual will” (意の霊, i-no ti) which is consonant to the word “life” (命) . One life due to the cells devision turned into two lives, into yin and yang, into male and female and gave birth to us. All these are kami’s will and the ancestor is one. Which means that we all are brothers and sisters. We all are one family. So do we need to fight against each other? 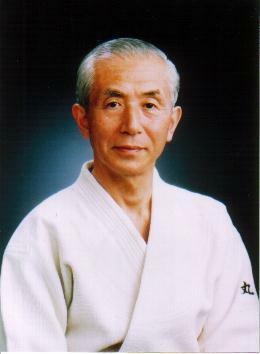 The aim of Aikido Yuishinkai as of true Budo consists in learning how a man should live, to understand it through the practice of a technique (waza) and forms (kata). The essential aim of it is Harmony. Love. Light. Then – to achieve a state of “unshakeable myself” (jettai-ni fudo-no jibun). For this one should learn to be aware of and to use three centers of tanden (upper, middle and lower levels). To do this it is necessary to learn to relax completely. Only when there is harmony and no tense it is possible to apply a true technique (art) . The forms and techniques (arts) in our school perfect the spirit of those who practice them. Some people watching the form of my students’ moves say different critical words but to understand the true meaning of this practice can only be possible with an open and calm mind. To understand something one should himself try to climb the mountain peak. So, if you have an opportunity, do this practice of harmony and ki energy together with me. They say: “It is better to see once, then to hear hundred times; it is better to feel once, than to see hundred times; it is better to understand once, than to feel hundred times”. I put all my soul into reitai (spiritual body) – the highest technique (art) created by me.